Steve Anasiewicz is a tinkerer, one of those do-it-yourself types. He built his own grandfather’s clock and his own home next to the Sourlands in Hopewell. As a retired electrician and private pilot, Steve has lots of items he carries with him. One day he was going to the beach and noticed he was bringing more and more items with him — an umbrella, a radio and a cooler to name a few. His non-motorized cart wasn’t cutting it. 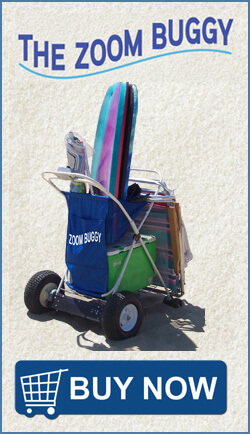 So, he decided to add a motor to his non-motorized beach cart. Wherever he took his now motorized utility cart everyone admired it and wanted one, even when he was loading it into his plane. And thus, he began creating his Zoom Buggy® on a larger scale so others can reap its benefits.